There is huge pressure to accommodate enrolment in colleges. In 2014, 71.3% of all unemployed people in South Africa were in the youth age group from 15 to 34 that is the biggest source of demand for post-school education. This amounts to more than 3.7 million people. The TVET colleges are in a phase of unprecedented enrolment growth. Head count students numbers have risen from 325 000 in 2010 to 725 000 in 2015 and with a further substantial increase to 1 200 000 mooted by 2019. These figures are highly impressive as they stand. Despite laudable increases in TVET enrolment, the education system needs to work harder to accommodate weight of demand for post school FET band qualifications from young people not in education, employment or training. At the same time it is vital to secure adequate quality in TVET programs which depend so much on the competence and commitment of college lecturers. Bring to light the experience of TVET lecturers who are central participants in any proposal to renovate colleges by: unpacking the formal and informal structures which facilitate and constrain TVET lecturer development, and reveal fragmentation of lecturer collegial relations which detract from individual and institutional development. Draw on employers’ perspectives about the preparedness of TVET college graduates seeking work in their respective sectors. Bring forward insights into the CIP program from the CIP monitoring and evaluation program. Who would be interested in the book? 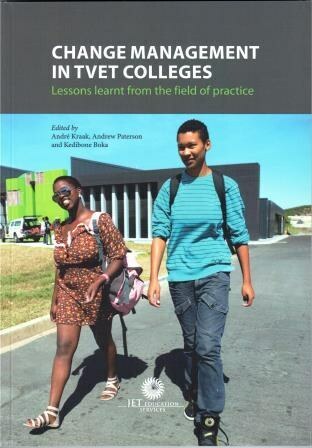 This book will offer valuable information and insights for readers interested in the recent past, or the future trajectory of South African TVET colleges.